Presents a new approach to the problems of understanding regolith geology and landscapes. 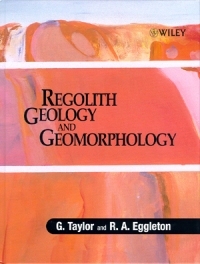 Presents the general aspects and principles of regolith and thus provides a thorough understanding of the subject. Provides information from an Australian perspective, hence bringing in new insights that have developed away from the traditional Northern Hemisphere ideas and concepts. Chapters present views on landscapes and their evolution, the nature of minerals, the behaviour of water at a landscape level and the exploration of water behaviour at various scales in regolith materials. Providing fundamental discussion of regolith properties and chemistry Regolith Geology and Geomorphology considers many landscape situations and features, whilst linking process to position, geochemistry and time. Presenting information from an Australian perspective it provides new insights into the subject, which are developed away from the yoke of traditional Northern Hemisphere ideas and concepts. Customer Service, John Wiley & Sons Ltd, 1 Oldlands Way, Bognor Regis, West Sussex, PO22 9SA, UK email: customer@wiley.co.uk. Please include your postal delivery address. European customers (both EU and non-EU destinations except the U.K.): Via surface add £4.50, Via air add £10.50. Non-European export destinations (eg Middle East, Far East etc. ): Via surface add $10.00 (£6.60) Via air $20.00 (£13.25). * Delivery will be arranged by John Wiley & Sons Ltd on your behalf via Wiley Distribution Services Ltd. Alternatively you may collect your order by prior arrangement. We can also quote for delivery by courier. (Please email cs-books@wiley.co.uk for details).